Russ Taff (born November 11, 1953) is an American gospel singer who is originally from Farmersville, California. His contemporary Christian music is pop-rock, often with traditional Southern Gospel influences, and on his 1995 album, a contemporary country music bent. His initial work was as the lead singer for The Imperials. One of his best-known performances is the song "Praise The Lord". 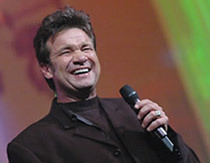 He has also been a member of the Gaither Vocal Band, and toured with Bill Gaither in the Homecoming series. Russ Taff as a soloist, is known for the 1980s anthem "We Will Stand". Russ Taff was the fourth of five sons born to a Pentecostal preacher father and a gospel music loving mother. He learned early on that when he sang, people sat up and responded with feeling. His trademark rich, emotion-drenched vocals were formed in that fertile environment. After moving to Arkansas in his teens, Taff began his singing career by forming a local band called Sounds of Joy, before being invited to join the legendary group The Imperials. As the lead vocalist with The Imperials, he toured extensively and recorded a number of award-winning albums. Leaving to pursue a solo career, Taff gained further industry prominence by releasing a series of innovative works that simultaneously delved into his musical heritage while pushing the boundaries of contemporary Christian music.